As with many design trends, trends in flooring also impact what types of transition strips and trims are needed for a project. 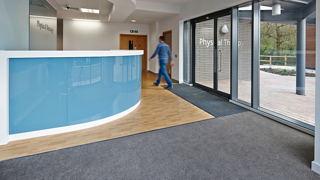 At Optimum Technologies, we work with hundreds of architects, designers, and flooring dealers all over the world who specify Gradus products and share what they are doing in the field. One flooring trend we have observed recently is the use of Luxury Vinyl Tile (LVT) in commercial settings instead of carpet. 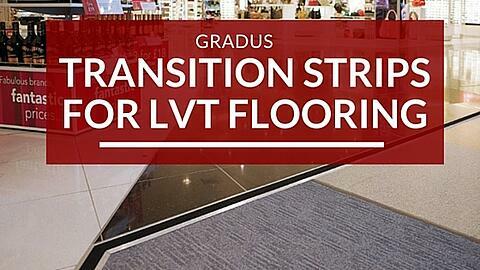 While there may be many types of trims that work well with LVT flooring, we are most knowledgeable about the ones manufactured by Gradus. Why Not Use Any Run-of-the-Mill Trim? Quality of Flooring: As one of my customers said to me recently, why would you want to use a transition strip that isn’t the same quality as the flooring that you’re transitioning between? You need a flooring profile that can stand up to the quality of the flooring without distracting from its beauty. Luxury Finishes: One of the great things about being the North American distributor for the Gradus line of flooring accessories is that they are a forward thinking company that stays on top of what is needed in the flooring accessory market. The Luxury Trim System offers some newer solid brass profiles that are available in six opulent metal finishes for use in prestigious applications where luxury floor finishes are installed. Versatile Configurations: The two piece transition strips have tops that are available in either a ramp or a “twin top” configuration. This means that you can join two different thicknesses of flooring with the ramp or two similar thicknesses of flooring with the twin top. 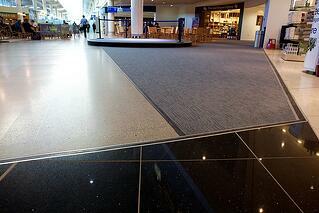 The aluminum bases are also available in various heights to suit a wide range of floor coverings. Once you have decided on a trim, keep in mind the following tips to ensure an optimal installation. The compressed thickness of the carpet should always be a tight fit between the thickness of the combined top/base. When installed with natural floorcoverings (such as ceramic tile or wood), a suitable gap must be left between the profile base and the flooring to allow for natural expansion. The bases should always be installed on top of resilient floorcoverings when used in a ramp configuration. The bases should be installed using a cartridge adhesive and screws. If you are looking for transition strips for your LVT flooring installation, you are undoubtedly considering many options. The Gradus Luxury Trim system may or may not be for you, depending on your budget. Even though Gradus has a full line of transition strips, the new Luxury Trim system is the one we find works the best for our customers’ needs.